COMPACT provides detailed certificates of analysis on its composite film packaging. Napco Composite Packaging Technology Ltd (COMPACT) of Dammam, Saudi Arabia has recently finalized an upgrade to its in-house testing laboratory. The composite film manufacturer supplies well-known multinational food and other manufacturers throughout the Middle East and North Africa (MENA) region. COMPACT’s Technical Department tests each step of the production process under specific sets of conditions and procedures. The company then provides customers with a detailed Certificate of Analysis to demonstrate conformity to the most demanding material requirements. 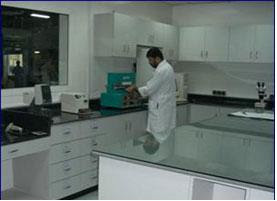 The Laboratory Manager reports directly to COMPACT Technical & Quality Assurance Manager. “Quality assurance remains a prime goal of the management,” confirms Armache. Established in 1993, Napco Composite Packaging Technology Ltd. (COMPACT) manufactures a wide range of mono-layer, laminated and coated film structures for manufacturers in the food and beverage, medical and industrial sectors. Its composite film packaging products are enhanced with computerized color-matching and flexo or roto printing.